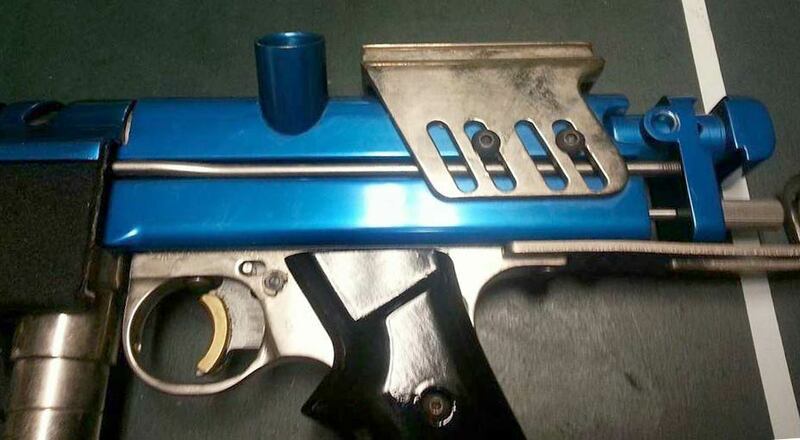 Earlier this month, January 4th, 2015, Ralph “RJ” Torrell, posted a couple photos of Mike “The Mouth” Telarico’s custom Jeff Orr Autococker to the Old School Paintball guns group on facebook. Right full shot of Mike Telarico’s Jeff Orr Autococker. Fred Dorski, Rick Pullen, Mike Telarico and Ray Gong at Top Gun Paintball c. 1993. Scanned from the June 1993 issue of Action Pursuit Games. Telarico worked at Top Gun paintball in New Jersey as the “head field judge,” was an early tech for WGP and played as a member of Shore Patrol. Left side of the sight rail attached to the body on “the Mouth’s” autococker. Many people have seen the later series of 3D bodies E Cockers that Jeff put out in the mid to late 2000s but his stylistic choices early on are more difficult to pin point. So when Ralph posted these photos of “The Mouth’s” totally custom full body Jeff Orr, I was excited! How the back block, bolt and body meet together. •Chrome (nickel?) plated WGP Inline, Frame and asa and Cocking rod. 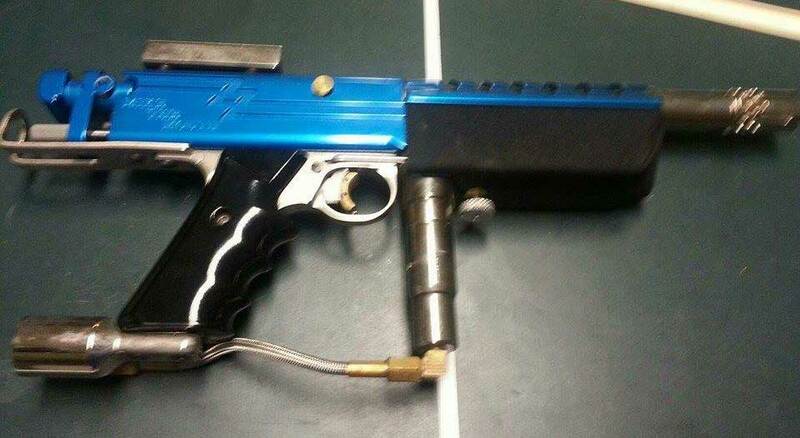 In messaging with Telarico regarding this Autococker’s customizations, he wrote to Ralph that, “The Front Block is from a Minicocker. If you look closely you will see there is a [bleed off knob to degass] the front block assembly between the regulator. 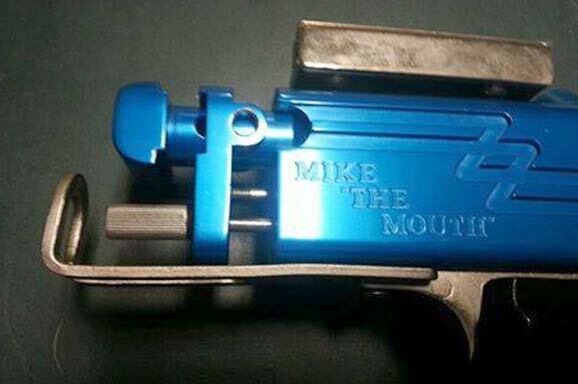 Serial number on “The Mouth’s” custom Jeff Orr Autococker. The serial number of around 20 thousand put this Autococker towards the end of 1994. 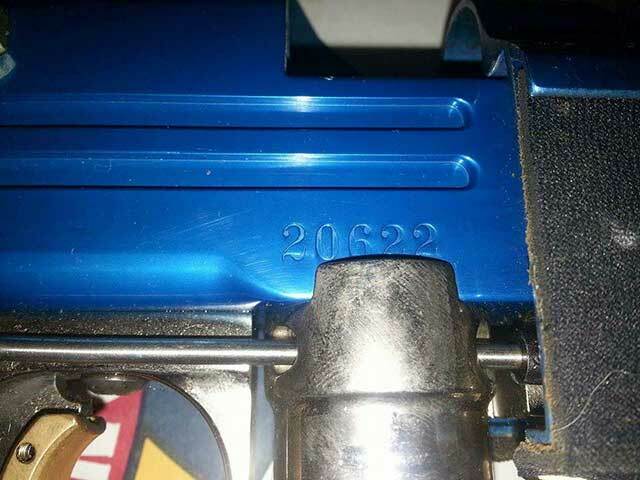 The Ironmen received their 16K Autocockers on April 2nd of 1994 so it would make sense that this Autococker was be from the end of that year or possibly early 1995. 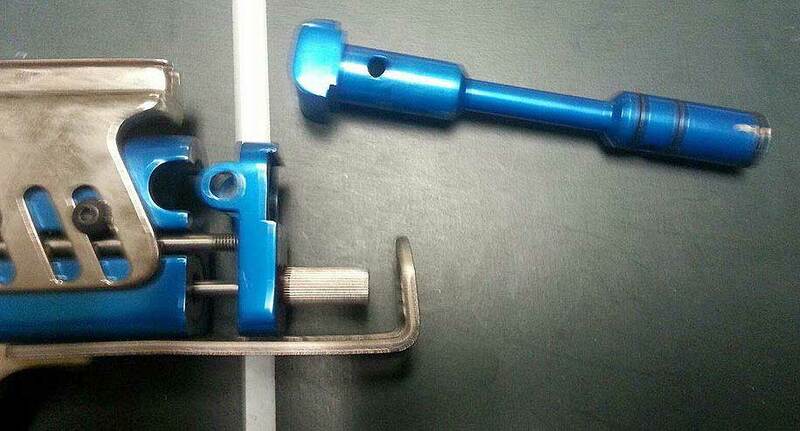 Bolt removed from back block. Giant thanks to Ralph for “unearthing” these photos and giving me permission to post them!